NEW YORK (AP) — As a kid, like a lot of us, Jessica Biel practiced giving a speech in front of a mirror for that fairytale moment when she won a top award. Jessica Biel believes "communication" is the secret to her happy marriage. The 36-year-old actress has been married to Justin Timberlake, with whom she has three-year-old son Silas, for five years now and is adamant the reason they're so strong is because they talk to one another about how they're feeling. Asked her secret to a healthy relationship, Jessica told People magazine: "Communication, communication, communication. Jessica Biel was left "totally in shock" after having to undergo an emergency C-section when her son Silas was born. The 36-year-old actress gave birth to her son - whom she has with her husband Justin Timberlake - almost three years ago on April 8 2015, and has said that despite gearing up for a relaxing and peaceful birth, she was rushed to hospital for the emergency procedure, which is where surgery is used to deliver a baby. Justin Timberlake and Jessica Biel are selling their New York penthouse. The couple - who married in 2012 and have two-year-old son Silas together - have put their lavish apartment in New York City's Soho district on the market for almost $8 million, according to real estate company Stribling. Justin Timberlake and Jessica Biel have "always wanted" another child. The couple - who already have two-year-old son Silas Randall - are reportedly keen to add to their family and are hoping for a little girl. A source told RadarOnline.com: "It's 'when' not 'if' they'll be adding to their family. They've always wanted another kid, but they waited until things got better. Now they are trying, hoping for a girl." Justin Timberlake has returned with a new album "Man of the Woods." Timberlake takes to 16 tracks to combine country, pop and R&B, and it's sure to keep listeners on their toes. Jessica Biel is Justin Timberlake's "number one fangirl". The 'Total Recall' actress posted a sweet tribute to her husband to mark his 37th birthday on Wednesday (31.01.18). Jessica Biel's "biggest fan" is her husband Justin Timberlake. The 'Sinner' actress - who has two-year-old son Silas with the 36-year-old singer - knows her spouse will always be "happy" with her career decisions as they are so supportive of one another and share the same values. She said: "With Justin, he's so happy for me. I always say he's my biggest fan. "We have similar values - we believe in loyalty, honesty. With sweetheart necklines and high slits, sheer lace and sparkly details, Hollywood women with men on their side turned the Golden Globes red carpet into a parade of fashion black in a protest with a clear message for sexual harassers: Time's Up. Jessica Biel knew she would marry Justin Timberlake after "a little bit" of dating. The 35-year-old actress has two-year-old son Silas with the 'Can't Stop The Feeling' musician - whom she has been married to for five years - and whilst she can't recall a "tangible moment" in which she knew Justin was the man of her dreams, she admits it didn't take long for her to see a future with him. Justin Timberlake and Jessica Biel have exchanged romantic messages on Instagram as they celebrated their fifth wedding anniversary. Jessica Biel was "selfish" before she met Justin Timberlake. The 'Sinner' star admitted she was always focused on her career and never thought of settling down and raising a family until she met the 'Suit and Tie' star in 2007 - five years before they got married - and her focus shifted. Jessica Biel says her son is "a total weirdo". The 35-year-old actress has son Silas, two, with husband Justin Timberlake, 36, and she joked that their little boy is really "strange". She said: "He is a total weirdo. But he's amazing. [Kids are] all weird. They're like these little lovely, strange, mini humans, and they're so specific." 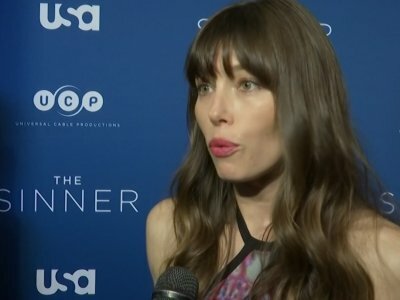 'The Sinner' actress also admitted that she struggles to balance her career with raising a child but acknowledged that it is something every parent goes through. Jessica Biel is "worried" about her son following in her footsteps. The 'Total Recall' star admits she is concerned about her two-year-old son Silas Randall - who she shares with her husband Justin Timberlake - taking a leaf out of his parents' books and going into the showbiz industry because she doesn't want him to face rejection. TV critic Gail Pennington is in Los Angeles for the TV Critics Association summer press tour, but she left you this list of seven shows worth your attention this week. Sam Worthington, Chris Noth, Paul Bettany and more star in an eight-episode scripted series about the FBI's long search for Ted Kaczynski, known as the Unabomber. Months after energetic, brunette twin boys from Aiken landed their first big acting gig, audiences will be able to see them on television. The USA Network's crime thriller, "The Sinner," starring and executive produced by Jessica Biel will air on Wednesday at 10 p.m. Three-year-old Aiken twins Connor and Jackson Viola play Biel's son in the series. Jessica Biel says the secret to her successful 10-year relationship with husband Justin Timberlake is them both being "career-focused". The 35-year-old actress - who has two-year-old son Silas with the 'Can't Stop The Feeling' singer - says the pair are both dedicated to their work and she says being "selfish" has allowed them to maintain a strong bond. Seth Rogen thinks Justin Timberlake is the "better looking version" of him. The 35-year-old actor took to Twitter on Wednesday (17.05.17) to point out the resemblances between himself and the 'Can't Stop The Feeling' hitmaker, as he said Justin and his wife Jessica Biel are incredibly similar to himself and his wife Lauren Miller. Jessica Biel says motherhood has made her "more emotional and more sensitive". The 'Total Recall' star - who has two-year-old son Silas Randall with her husband Justin Timberlake - loves being a mother and says it has "informed everything in her life". She told E! News: "I don't know if that sounds kind of goofy. I just feel like I'm always ready for anything and everything at this point. Motherhood informs everything in your life. I'm more emotional, more sensitive, more everything to the world." Chris Evans has never had any "bad breakups". The 'Captain America: Civil War' star - who has dated the likes of actresses Jessica Biel, Christina Ricci and Jenny Slate - insists he is on good terms with all of the women he has romanced in the past. Asked if he runs into any of his exes in Los Angeles, he said: "It's very rare. But I've had no bad breakups in my life. Typically, if I see an ex, I give a big hug, and it's wonderful to catch up. Smart Rating: 16.83Genre: Romantic ComedyStarring: Freddie Prinze Jr., Jessica Biel, Matthew Lillard"Summer Catch" is a coming-of-age romantic comedy set against the backdrop of the Cape Cod Baseball League. Local boy Ryan Dunne (Freddie Prinze Jr.), now a pitcher for Boston College, meets Tenley Parrish (Jessica Biel), the daughter of a wealthy couple who summer on the Cape. Ryan and Tenley fall in love, much to the chagrin of their families, while Ryan clings to one last hope of being discovered and signed to a pro baseball contract. Smart Rating: 17.81Genre: Romantic ComedyStarring: Gerard Butler, Jessica Biel, Uma ThurmanLong past his soccer-playing heyday, George Dryer (Gerard Butler) is struggling financially and failing in his attempt to reconcile with his ex-wife, Stacie (Jessica Biel), and young son, Lewis (Noah Lomax). When Lewis' soccer team has an opening for a coach, George steps up. Not only is George a big hit with the children, but he also attracts lots of attention from some of the players' single and unhappily married mothers (Uma Thurman, Catherine Zeta-Jones). Justin Timberlake and Jessica Biel "don't know" if they always like their young son. The couple think 22-month-old Silas is "amazing" but are finding things quite "hard" at the moment because he is going through a difficult stage, but they are hoping it is a phase that doesn't last. Speaking on the red carpet at the Oscars, Justin said: "He does not want the diapers changed. He's hitting his terrible twos a little early, so we're hoping he'll get out of them a little early." And the red carpet goes to ... the women in red, for one, with equal accolades for shiny and shimmery gold worthy of the Oscars, this and all years. Jessica Biel eats breakfast in the shower. The 34-year-old actress is too busy to think about food most mornings because she's so focused on feeding her 22-month-old son, Silas, and getting him ready for the day. Discussing a photo she posted on Instagram of a coffee cup and empty plate in the shower, the 'Book of Love' star said: "This is just mom life. I don't know if anybody else does this, [but] I don't have time for anything. A rainy evening and 2-year-old twins Jackson and Connor Viola scurry into their grandmother's home in Aiken. In matching gray and white striped shirts, jeans and brown shoes, the two smile at each other, play while bouncing from chair to chair and head right to their toys when allowed. “They’re very lively. They’re busy boys and as sweet as can be," their mother Melissa said, describing them. "I know I’m bias, because I’m their mom but they’re really cute and they’re identical." LOS ANGELES — Democratic presidential nominee Hillary Clinton is set to conclude a two-day visit to Los Angeles and Orange counties today by holding a star-studded Hollywood Hills fundraiser and two fundraisers in Laguna Beach.